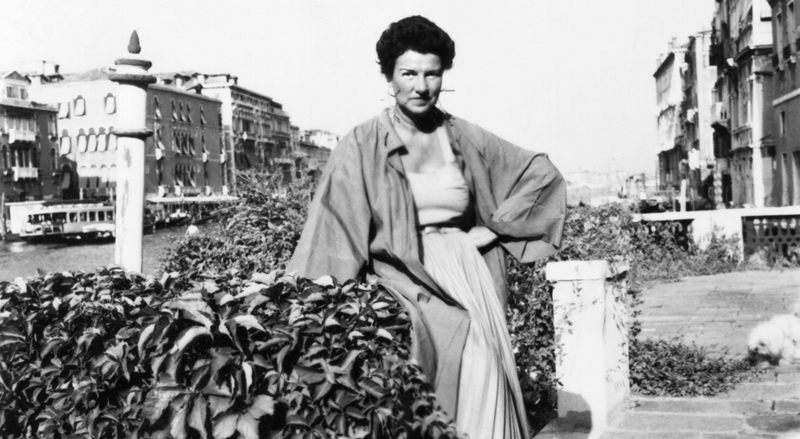 Peggy Guggenheim is unquestionably one of the more fascinating characters of the twentieth century and the object of infinite curiosity and opinion. She has inspired numerous books (Peggy The Wayward Guggenheim) a play, (Woman in a Glass, portrayed by Mercedes Ruehl), a film (Pollock), and now a documentary film which is, to my mind, the portrait that she deserves. By that I mean that the film effectively unveils the public and private sides of this enigmatic and complex woman in a manner that perfectly mirrors her style, her persona and her milieu. Vreeland’s intrepid research was richly rewarded when she unearthed audio tapes of interviews from the late 1970‘s with Jacqueline Bogard Weld, her official biographer. Guggenheim’s own words in her own voice provide the heart and soul of the film revealing her humanity, vulnerability and sangfroid. To hear her describe some of the terrible and tragic events in her life - the death of her father on the Titanic (with his mistress), the suicide of her daughter, the brutality of her first marriage, estrangement from her family, and the pain and disappointment of subsequent love affairs is extraordinarily personal. This core material is then draped, embellished and filled in with the trappings of her life, her family, friends and lovers, homes, art, her work and her world in the form of personal films and photographs. She then creates the stage with context by using cleverly-edited archival footage and still photographs of the period accompanied by a jaunty and brilliantly evocative musical soundtrack - all of which is woven together with a syncopation and fractured layering which reflects the avant-gardism and cacophany of the art world which Guggenheim so ardently embraced. All of this creative filmmaking is brought intermittently into the present by comments by contemporary talking heads (Larry Gagosian, John Richardson, Arne Glimcher et al) opining on her motivations and assessing her impact and her place in the history of 20th century art. What a life she led. Born into a hugely successful German-Jewish family in New York, the life of the haute bourgoisie did not suit her at all. As soon as she was able she decamped to Paris where she found her niche among the louche libertines and avant- garde artists living la vie boheme. She had inherited a small (by Guggenheim standards) fortune which provided her a comfortable lifestyle and she was able to be a patron of the artists with whom she was now fully ensconced. 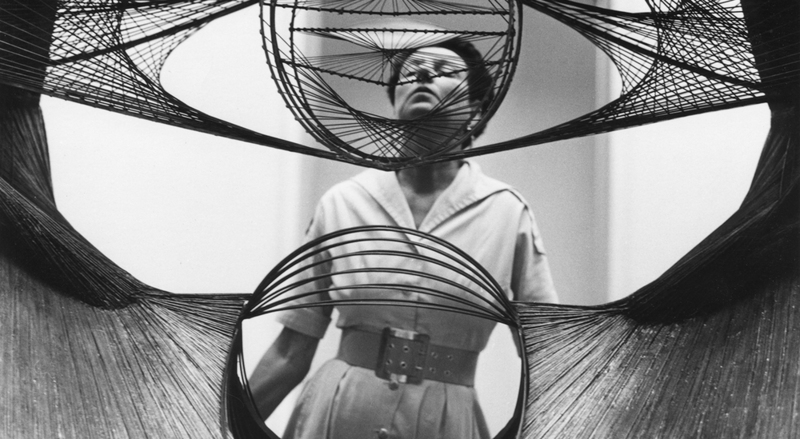 Her circle included all of the artists and writers who were breaking new ground and creating new movemnts - surrealism, cubism, Dadaism. By her own account she slept with nearly all of the heterosexual ones - notables include Duchamp, Beckett, Brancusi, Pollack and Max Ernst whom she married. And the list is very long. She entertained lavishly and bought art constantly which became her second obsession. She amassed a first rate collection. Everything she did was excessive and passionate. She married twice, had two children, opened two galleries - Guggenheim Jeune in London and Art of This Century in New York City - after saving her own collection from Paris anticipating Hitler’s occupation. Finally she moved to Venice and settled herself and her collection in the small palazzo which remains as a museum bearing her name and which is one of the jewels of Venice today. She lived there for the remainder of her life and is buried on the premises with a dozen of her shih tzu dogs. Her greatest triumphs were when the French finally recognized her collection by giving her a show. This was validation for the perceived slight by France not feeling that her collection was important enough to remove for safekeeping pre-WWII. Her second was finally being acknowledged by her own family in the form of her uncle Solomon Guggenheim agreeing to incorporate her collection intact and in situ housed in her Venetian Palazzo Venier dei Leoni. In some circular way, it is as if she returned to her family at the end of her life, albeit on her own terms. That could sum up this remarkable woman. She lived her life on her own terms and it is one well-worth knowing about.